Terrie LloydThe surprise for most foreign businesspeople is that most laws in Japan are not clearly defined and thus the emphasis on doing lawful business is to meet the spirit of the law, rather than the letter of the law. This means one’s actions speak louder in a conflict resolution than one’s intelligence—a great way to level the playing field. Peter Harris Dear Readers -- I hope you are enjoying receiving the magazine more regularly. This issue is our legal special and we are excited to cover what seems to be a thriving industry, in spite of the credit crunch. In June this year, London’s ‘Magic Circle’ top law firms announced record turnovers with Clifford Chance reporting a leading revenue figure of £1.3 billion, up 13% from last year. 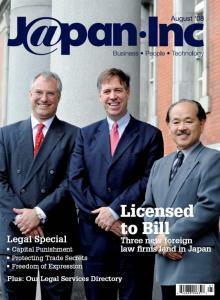 In Japan, the industry can also be said to be experiencing something of a boom and our cover story features three firms that have recently opened Tokyo offices; we spoke to them about the growing need for their services and consider how their arrival might change the dynamics of the industry. Dear Editor -- It is widely known that Dentsu is a corporate giant with the lion’s share of business; its presence and contacts in the marketplace are unmatched. But surely, its success is not born entirely out of ignorance, bullying and grey practices as the article seems to suggest. By Gavin Blair -- Is freedom of expression in Japan under threat? -- In February, the director of the “Yasukuni” documentary and staff at his production company received death threats, and in March a number of cinemas pulled the film after pressure from politicians and nationalist groups. April saw a freelance journalist ordered to pay compensation for libel over an article he didn’t write but was quoted in. In May, 38 demonstrating students were arrested for trespass on their campus at Tokyo’s prestigious Hosei University and detained without charge for three weeks. By Peter Harris -- With three new foreign law firms entering the market, J@pan Inc looks at the changing dynamics of the legal industry in Japan. -- On April 1 1987, the Japanese government started to allow foreign lawyers to practice in Japan, provided that their business was limited to advising on law from different jurisdictions and international law. Immediately, major firms such as Morrison Forrester and White & Case opened Tokyo offices and by 1994, 48 foreign firms had opened in Japan. As the economy went through more turbulent times, some of the firms left the market, for example, Brown & Platt in 1995 and Macfarlanes in 1997. Recently however, the number of new openings appears to be on the up with three firms, Quinn Emanuel, Norton Rose and Ropes & Gray having been granted licenses by the Ministry of Justice within the last 12 months. Off the record, some other firms have also told us that they have plans to open a Tokyo office in the near future. By Jiri Mestecky, Registered Foreign Attorney, Kitahama Partners -- A legal expert writes on protecting trade secrets and personal information in Japan -- There is no doubt that one of the most important aspects of doing business in any country is protecting company trade secrets as well as individuals’ personal information. Nonetheless, trade secrets and personal information are not necessarily the same, and where different, are protected by different laws. This is true under the laws of Japan as well as those of other countries. The purpose of this article is to briefly explain the legal framework for the protection of these two types of extremely important proprietary and confidential information under Japanese law. J@pan Inc is pleased to present our comprehensive Legal Services Directory. By Anna Kitanaka -- Citizen judges and the future of the death penalty -- On December 18, 2007, the United Nations General Assembly voted on a landmark resolution calling for a global moratorium on executions, with a view to eventually abolish the death penalty. In all, 104 countries voted in favor, 54 against and 29 abstained. Those against the resolution include Afghanistan, Bahrain, Zimbabwe, Kuwait— and Japan. The European Union, Canada, South Africa and a growing portion of Latin America have already abolished the death penalty. The US and Japan are the only two major industrialized nations left that still hold onto the death penalty, despite the growing widespread movement for abolishment. How long can Japan hold out against mounting international pressure? But more imminently, how will the country’s implementation of the lay judge system affect the outcome of sentencing? By Greg Lane -- It’s electric, stupid -- In the same way that hybrids stole the limelight from purely electric vehicles a few years ago, ‘plug-in’ electrics look like they are about to steal the thunder from hydrogen ... -- Waseda opens ‘campus’ in Second Life -- Private university Waseda has shown that it is ‘down with the kids’ by opening a ‘virtual campus’ in Second Life. -- High Speed Wireless at High Speed -- JR Tokai, operator of the Tokaido Shinkansen which runs between Tokyo and Osaka, has announced that high speed wireless internet will be introduced on its N700 series trains from March, 2009. -- Sharp and Kepco build PV farm -- On his blog ‘On the Inside looking In,’ venture capitalist Shin Fukushige reports on the plans by Sharp and Kansai Electric Power Company (KEPCO) to begin constructing a 28MW photo-valtaic (PV) solar cell farm mostly on the roof of Sharp’s Sakai 10G LCD/thin film PV plant -- Artificial DNA created in Toyama -- Researchers at the University of Toyama are reported to have developed a completely new class of DNA composed entirely of artificial nucleosides.